Italian immigrants introduced cooking pasta to the United States in the 1920s. Marco Palo introduced pasta to Italy after a visit to China and enjoyed eating noodles. Although you may be surprised to know that the best pasta in the world is produced in Russia and is called "amber Durham." With the wide variety of pasta machines and pasta cookwares on the market today the variety of pasta dishes and recipes are only limited by your imagination. Pasta has gained popularity over the years, not just because of the variety and delicious Authentic Italian Recipes it's also convenient, extremely inexpensive and nutritional. 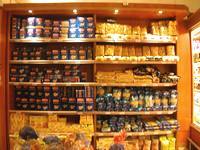 Besides making your own pasta you can also find a wide variety of shapes and sizes of pasta on your grocery shelf. 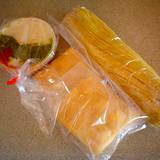 If you are purchasing packaged pasta, an important tip is to never buy pasta that is packaged in clear plastic or has a plastic window to see through. That's because the light will cause the pasta to lose many of its nutrients. Find a pasta that comes in a box or bag with no clear window. Always boil your water from fresh cold water, never use hot water from your tap to speed up cooking time when cooking pasta. Hot tap water usually has lead in it! Put about a tablespoon of salt in your water before boiling, it will not only season your pasta it will also speed up your water boiling time. When cooking pasta using fresh homemade pasta it takes very little time, depending on what kind of pasta your cooking, it could take only seconds to just a few minutes. Angle Hair pasta only takes 3 or 4 minutes to cook once the water boils. Be careful not to overcook. Only cook pasta until it's slightly chewy, (al dente), when cooking pasta the more you cook pasta the more nutrients will be lost in the water. 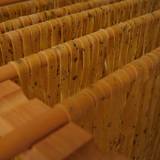 If you are making pasta dough, don't make it on a rainy or high humidity days it will become difficult to knead. When draining pasta run hot water into the colander before draining the pasta into it. A cold colander will cause pasta to stick together. When making stuffed pasta, like lasagna or stuffed shells, always let stand in cold tap water after rinsing, this will ease in handling the host pasta and also keep it from sticking together. Purchase a stainless steel pasta pot with the colender inside, it makes the task of draining the pasta so much easier and safer. All you have to do is lift the pasta out of the boiling water and give a few shakes to drain the excess water. Pasta cookware has become an important part of your kitchen tools. Keep a nice variety of authentic italian food on hand so when cooking pasta your time is wasted on shopping for odds and ends. 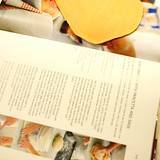 Read the hints and tips at Grandma's Italian Kitchen for stocking up on the right ingredients. When making fresh pasta a good pasta machine makes the process so much easier but you can always use an old fashioned rolling pin and a pizza cutter to form the shape you desire. 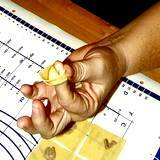 Rememeber Pasta cooking time is different with fresh homemade pasta, it only takes a few minutes. Pasta is composed of several ingredients but the main ingredient is the flour. The coarsest part of the wheat is seminola. 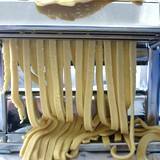 Pasta dough need to be very stiff and is therefore only 25% water compared to bread dough, which is about 40% water. Durum Wheat Seminola is the choice of most of the better quality pastas and contains very low percentage of starch and high percentage of protein. The gluten matrix is very strong since the protein does not have to compete with the starch for the moisture. Because the protein is strong it can be extruded by machine without falling apart. Standard flour pasta is easily broken and is the poorer quality product. In a mixing bowl stir together 2 cups flour and salt. Make a well in the center. Mix eggs, water and oil; add to flour and mix well. Sprinkle the remaining flour on the kneading surface. Turn dough on the surface and knead until the dough is smooth and elastic, about 10 minutes. Cover and allow to raise for 10 minutes. 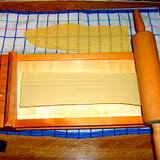 Divide the dough into thirds, using a rolling pin or pasta machine to roll the dough. Cut pasta as you desire. Cooking pasta isn't that difficult. It just takes practice and a bit of patience, let your imagination soar and create your own family recipes. If you need a few ideas for some really tasty Authentic Italian Recipes then by all means check out the rest of Grandma's Kitchen for some easy pasta recipes. If you have a few recipes of your own, please submit them to Grandma's Kitchen and share them with the world. Do you have a kitchen tip, trick or recipe you'd be willing to share with Grandma's Wisdom? Just click on the link below and start typing!